"Better Together" - Finale: "At The Mercy"
While in the Black Mercy dream world, Superman, Batman and Wonder Woman are desperately trying to find a way to return to their bodies while the little girl White Mercy watches on. Mongul has meanwhile inhabited Superman's body in the real world and the only people that can stop him are trapped. White Mercy realizes too late that Mongul crafted her with the Black Mercy not as a daughter to love but as a means to an end. Having touched each of the Trinity so closely in their memories she began to truly feel alive. In the real world Jon fights his father with heat vision bursts much to the shock of Poison Ivy, while in the dream world the Black Mercy crafts all kinds of illusions to keep the Trinity trapped. 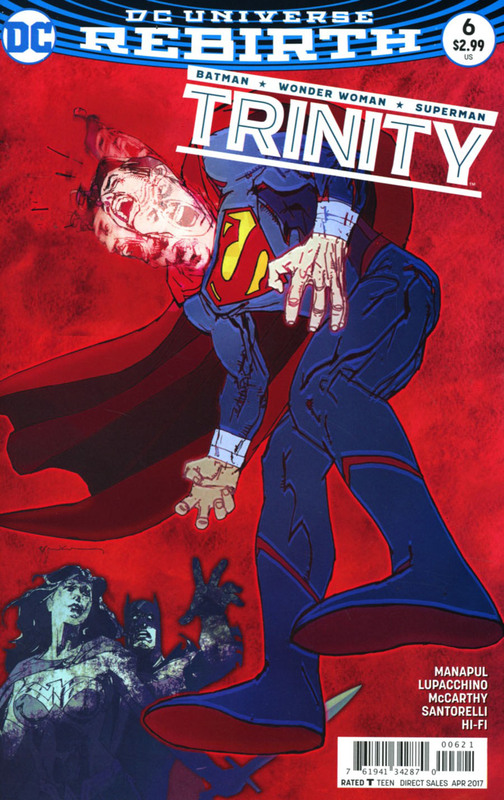 Bruce reawakens with White Mercy in his body and reveals a kryptonite amulet which knocks Mongul out of his body and allows Superman to re-inhabit it. Ivy realizes that her 'daughter' saved them and pulls the black mercy from Bruce's chest White Mercy begins to fade away as Bruce returns to his body. 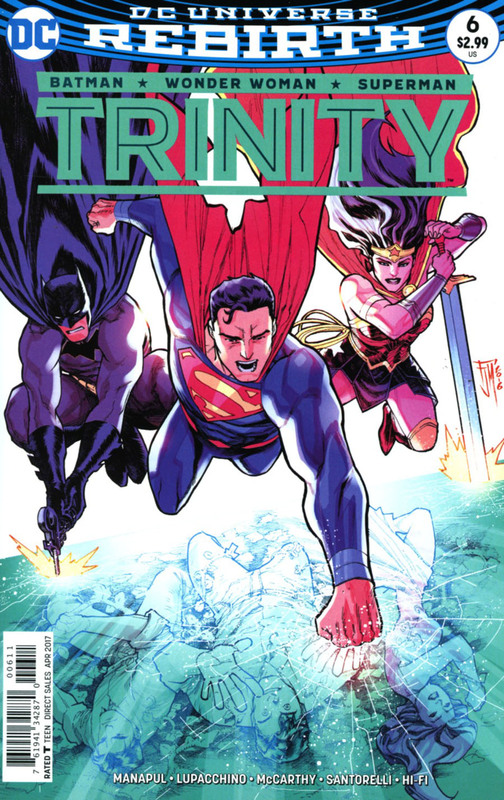 Diana forces her way back into her body and though the danger is over, White Mercy is gone and with her, the memories of Mongul and the identities of the Trinity go with her. As the Trinity wind down after a hugely stressful event, and Mongul lost in the dream state of the Black Mercy, nobody notices a young plant based child hiding in the corn fields of the Smith Farm. Story - 3: To review this issue as a singular is unfair, it is the sum of its parts and to that end it delivered some fantastic twists and turns along the way, but ultimately it fell short this issue and I'm not sure where it went wrong for me. I know the dispatching of Mongul after such an elaborate scheme was a bit too easy and honestly left the Trinity as bystanders in their own book. Then we have Poison Ivy, relegated to one liners this issue with only one scene of note when she says goodbye to her daughter and has a mind wipe after potentially learning the secrets of Diana Prince, Clark Kent, Bruce Wayne and Jon Kent. How amazing would it have been had she retained that knowledge? By stealing away the dangers and by erasing it all, what did we really get? A cool if not superfluous look into the Trinity and all we really got was that a young child housing either White Mercy or Mongul is hiding in Hamilton County. It has too many moments I loved to completely tear it apart but the pay off went nowhere and after riling me up with the past issues I was left disappointed by Better Together. I hope Trinity of Evil lives up to its promises. Art - 4: Lupacchino doesn't deviate from Manapul's challenges set up in the writing for a moment, delivering some stunning layouts. One criticism is that everything is paneled. There was definitely a need for some splash pages or double page spreads to fully escalate the story, perhaps the safety of panels was what hindered the story itself as nothing felt like it was truly at 'blockbuster' levels unlike previous chapters that thrived on energetic and frenetic layouts. Cover Art - 4: I like the theme of the cover, not the angle. The energy is there, the 'A-Ha music video' mirror thematic is there but the perspective makes it a little awkward. I think I would have preferred a side view as opposed to a top down camera angle. Variant Cover Art - 2: It's a no from me. It might suit a pop art exhibit but as a cover it was just a bit too off the wall. Nothing on it really worked for me as a consumer at all. Piece of art, yes. Comic cover, no.